The fans are on their feet cheering excitedly at a local futsal court in Palangkaraya. They roar as I receive the pass on the wing at midfield. I immediately juke the defender and dribble past him. I can sense the opposing team’s fear as I advance up field. My incredible ball skills leave the next defender stumbling as I sprint past him and finish the play with a brilliant shot on goal that even the opposing goalkeeper applauds. Just kidding, this is an apt description for some of my most talented futsal-playing students, but my own skills leave much to be desired. Normally, I am the defender who is getting dribbled past or desperately trying to catch up with my much more gifted students. My primary skills are effort and being much larger than the vast majority of Indonesian futsal players, which is helpful, but unfortunately does not protect me from being humiliated quite often on the futsal court. Futsal is a variation of soccer played on a small field, usually indoors, that features five players on each side, one of whom is the goalkeeper. In my experience most teams have either two or three forwards, while the remaining player(s) plays defender. There is no offside rule and each side must cover a lot of ground, so futsal formations are fluid and depend on the energy level of the players involved. If the ball goes out-of-bounds, teams kick it in instead of throwing it into play, but otherwise it is very similar to soccer. It is a relatively easy game to learn, although difficult to master. My first exposure to futsal was during our Fulbright English Teaching Assistant (ETA) orientation in Bandung. During our stay, our cohort was invited to play by members of the hotel staff. Despite having multiple very talented former college soccer players, we were annihilated by the opposing team. They were extremely gracious and some of our goals were definitely the result of them playing down to the competition, which did little to take the sting out of our defeat. 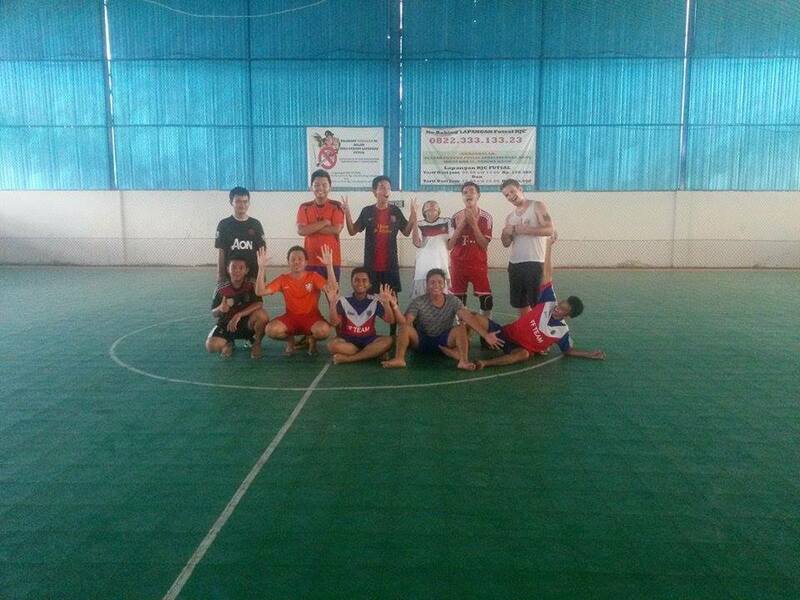 However, we all had a great time and we enjoyed it so much that we organized a second futsal game several days later. Luckily for us, only ETAs and our superb Indonesian language instructor Moko participated, so we were spared another one-sided beat down. I had many great experiences in Bandung, but these two matches were undoubtedly the highlight of my orientation. Team sports often bring out the best in people as a group of individuals forms a cohesive unit with a common goal. There is no feeling that can compare to the thrill of setting up or scoring a goal, no matter how rare they are. When I arrived at my host school, SMAN 2 in Palangkaraya, Central Kalimantan, I was cautiously optimistic that futsal would be just as popular in Kalimantan as it is Java, and I was not disappointed. I am always excited when I receive invitations to various events, but nothing improves my mood more than when my students or friends invite me to play futsal with them. Invariably, I am one of the least-skilled players, but I always have the most fun. It is a truly beautiful game that leaves its players tired, yet immensely satisfied. At SMAN 2, each class has its own team with their own jerseys, nicknames, etc. Unfortunately, many of the classes play infrequently due to their large amount of schoolwork. However, when you do see these students play, you immediately recognize how talented many of them are. Futsal is an activity where language proficiency is not necessary, so for once nobody has to apologize for their language skills. The beauty of team sports is that they transcend all boundaries. I wrote previously about the culture shock I experienced as an introverted bule in Indonesia, but I think it is widely accepted that people from different cultures often struggle to understand each other, especially initially. I, just like many of my fellow ETAs, struggled to adapt to Indonesia during the beginning of my grant. 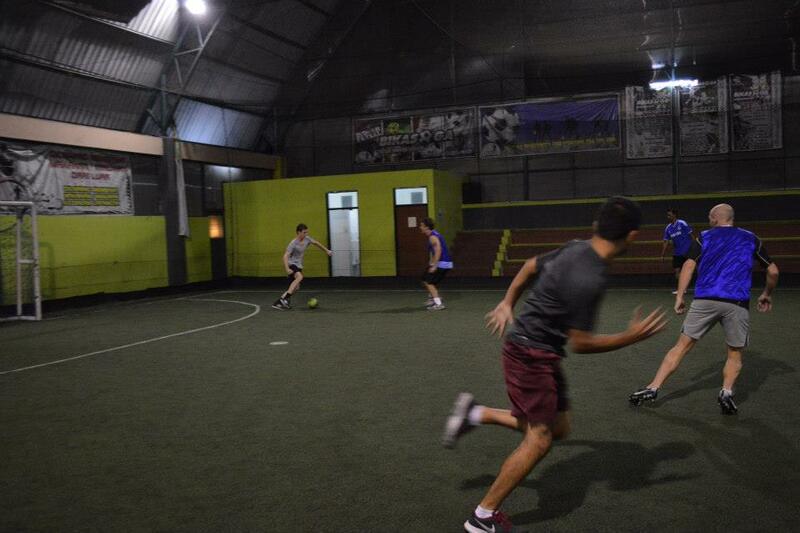 Futsal has served as an icebreaker and an activity, which usually facilitates more nongkrong, or hanging out. It sounds cheesy, but being able to experience cross-cultural exchange through futsal has been a truly amazing experience. Nor have I come to Indonesia empty-handed as I will be teaching my students to play dodgeball soon, which will hopefully be just as fun for them to learn as futsal has been for me. February 5, 2015 in Culture.